Welcome, we’re glad you’ve found us! Come visit one of our multidisciplinary clinics that offer a variety of services aimed towards the prevention and treatment of your injuries. Whether you are looking for physiotherapy, massage therapy, acupuncture or occupational rehabilitation we’ve got you covered here at TSL Physio. Contact us today for more information or to book an appointment. 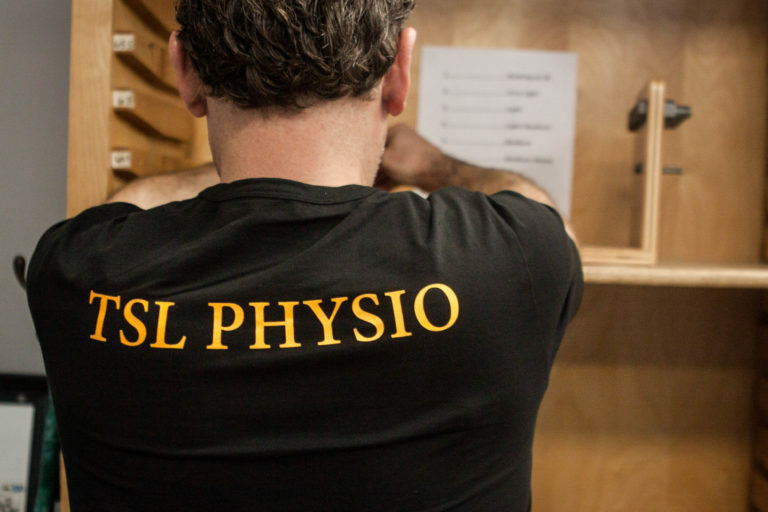 Learn more about TSL Physio! We specialize in making you feel like yourself again! At TSL Physio we work with our clients to maintain or increase their quality of life by developing and restoring maximum body movement and functional ability. Our physiotherapists combine an in-depth knowledge of how the body works with specialized hands-on clinical skills to assess, diagnose and treat symptoms of illness, injury or disability. At TSL Physio, we have two physiotherapists who use acupuncture as part of their treatments and we also have a registered acupuncturist. Acupuncture is used to encourage natural healing, improve mood and energy, reduce or relieve pain and improve function of affected areas. Our therapists will use their knowledge of your injury and recovery journey to see if acupuncture is right for you! Registered Massage Therapy has long been a part of the multi-disciplinary clinic approach at TSL Physio. Your treatment plan is customized to your needs and the techniques used are specific to your illness, injury or disability. Our massage therapists use a variety of techniques including Swedish massage, deep tissue massage, cupping as well as, fascial and trigger point release. We offer massage appointments for any stage of life including children, seniors, pregnancy and any point in between. At TSL Physio we are dedicated to helping injured employees return to work as safely and as quickly as possible. Our Registered Physiotherapists offer complete care through a single provider which simplifies the treatment and claim-management process. If you are an injured employee or an employer looking for more information contact us today and we will be happy to help with any questions you may have. Keep up to date with what's happening! As most of you have already seen in the clinics, we have been fundraising with a different event each month to raise money for the Janeway. We just wanted to update you on some of the events gone by and some of the ones still to come! Our goal is $5000.00 and all events will give clients and staff an opportunity to donate so if you would like to help us reach our goal keep checking back on how you can contribute. Are you suffering from pain due to tight muscles, fatigue, infertility, anxiety, or sleep disorders? Emma will help devise a treatment plan just for you and your specific needs. Check out our acupuncture page for more information on how it can help you! Our staff members joined the Ronald McDonald House along with many other offices across Newfoundland to Sock It for Sick Kids and their families. Check out this article to see our staff rockin’ the striped socks and how our clients helped too! Read more news from TSL Physio! Dan and Liv are just awesome! Over the past few years I’ve gone to both for injuries and with great success they got me through it and back to myself! Along with their professional service, their staff and facilities are just impeccable! Proud to be a part of the following organzations.